I have 2 graphics cards in my laptop (Alienware M11X); the first is the default Intel graphics card, and the second is a high perf Nvidia card. I have tried starting steam.exe with the Nvidia card, but that doesn't change the card the game uses. I have also tried setting the Nvidia card to the default card to use for all programs, but the game still does not use it. Is there a way for me to do this? When you start the game from Steam, the .exe will be opened, which will now run with your NVIDIA card by default rather than your integrated card. I've noticed that most older games, when started, will use the integrated card by default. The method described above can be used for any .exe file, not just games in your steam library! Just in case, I suggest updating your GPU drivers up to date. If you want to be sure Optimus is working as it should, try monitoring your GPU temperature during gameplay or stress test. This may not answer the question exactly, but could help determine if the nvidia card is being switched to during high load (which is part of what the question is about). Using this tool you could be sure about whether the optimus technology is actually working and you may not have to force anything since its for the best. But if you really need the dedicated card to be grinding all the time then you can force it through the nvidia control panel as others have said. All you have to do is run the tool and then when you think the load is heavy, like in the middle of a huge battle ingame, you alt-tab out of the game and you can clearly see the state of optimus in the tool. I think what is confusing you is just because Steam gives you that pop-up doesn't actually mean that you are using it. 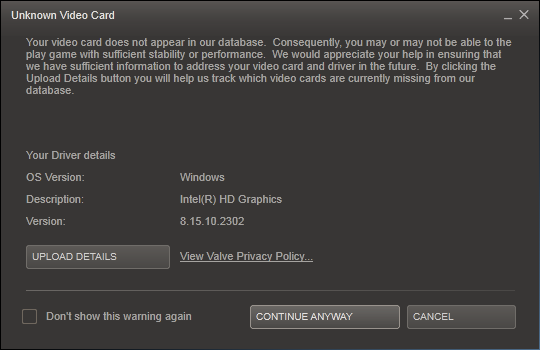 On my laptop I get the same message, but if I was actually using the Intel GD Graphics chipset. The game would not be playable as it does not support certain pixel shaders. So in reality you can just ignore the message, as more then likely in your case you are using the dedicated video card. I have the Alienware M14X, and if I'm not plugged into an AC outlet, and Window 7's power options is not set on "High Performance" then I get this similar error in other games. Make sure that you're plugged in and that the Power Options in Windows is set for High Performance. Edit: I believe that Henry2626's solution equates to the same thing as mine, but it's a more roundabout way of enabling "High Performance." Another way to enable this without going into Power Options is via the tray where you see the battery/charge icon near the clock. Clicking on this will give you some power options, but if you don't see High Performance, click on "More Power Options" which will take you to same Control Panel area that I originally advised. It's a bug with the ATI card. It seems that the card becomes unresponsive - so optimus switches out to the intel card. Usually turning off the Alienware, pulling the power cord, pulling the battery and holding the power button in will resolve the issue. This might be a little dumb but... Are you sure your monitor is plugged to the high end card? Not the answer you're looking for? Browse other questions tagged steam graphics-card or ask your own question.